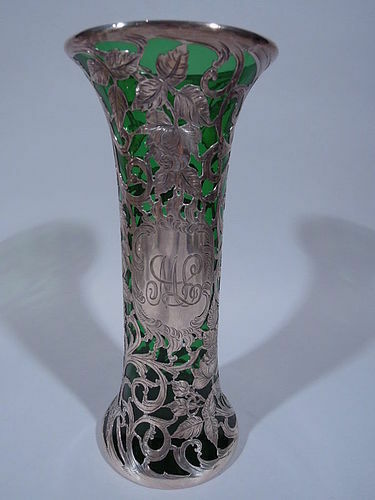 Art Nouveau emerald glass vase with engraved silver overlay. Made by Alvin in Providence. Bellied bowl with cylindrical neck and flared rim. Foliate scroll pattern interspersed with flowers. Asymmetrical cartouche engraved with script monogram. Hallmark includes no. G387. Very good condition. 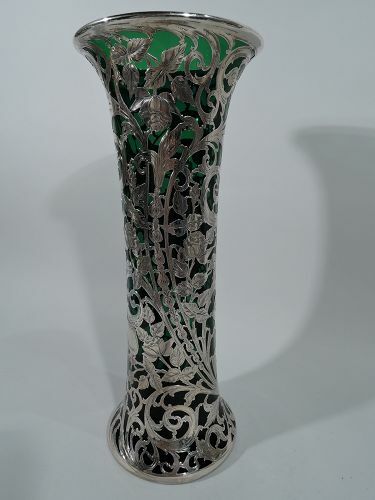 Tall Art Nouveau emerald glass vase with silver overlay. Made by Alvin in Providence. Cylindrical with flared rim and spread foot. Dense and engraved foliate scrolls and flowers. A fluid and dynamic design with lush blooms. Scrolled cartouche (vacant). Hallmark includes no. G3329. Very good condition. 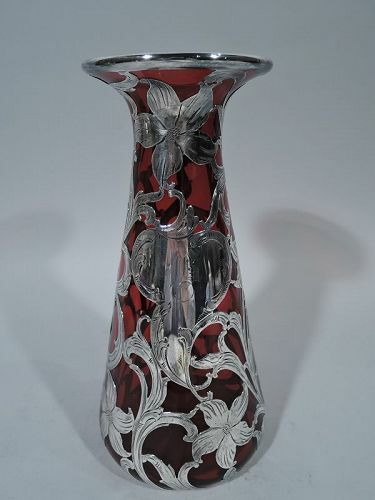 Fine quality art glass vase with silver overlay by historic New York maker Quezal, ca 1900. 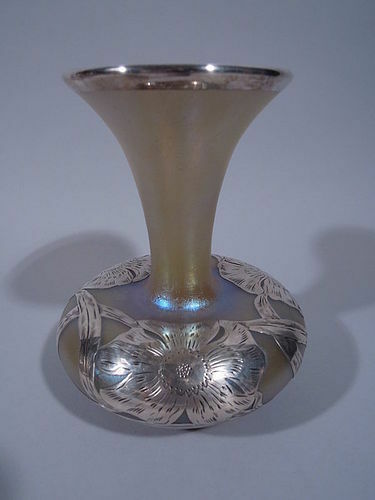 Fluid baluster bowl on stem on raised foot. 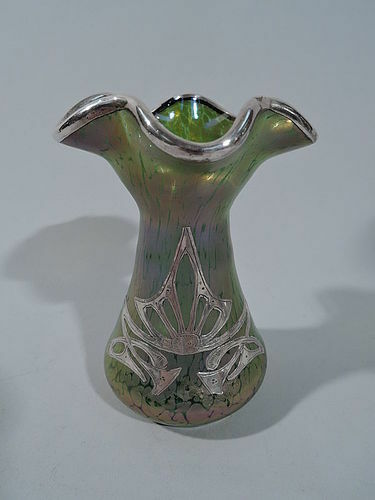 Iridescent polychrome glass in shades of green, yellow, purple, and blue overlaid in silver with lush blossoms and whiplash stems. Beautiful form and nice shimmer. Signed. Very good condition. 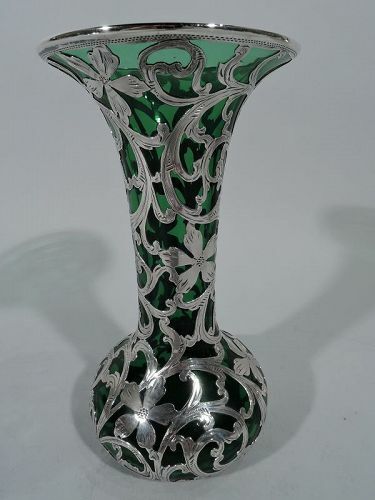 Art Nouveau emerald glass vase with silver overlay. Made by Alvin in Providence, ca 1900. Cylindrical with spread base and flared mouth. Dense overlay heightened with engraving in form of flowers and scrolls. Scrolled cartouche has engraved script monogram. Hallmark includes no. G3326. Very good condition with deep patina. Rainbow art glass vase with silver overlay. Made by La Pierre (later part of International) in Newark, ca 1900. 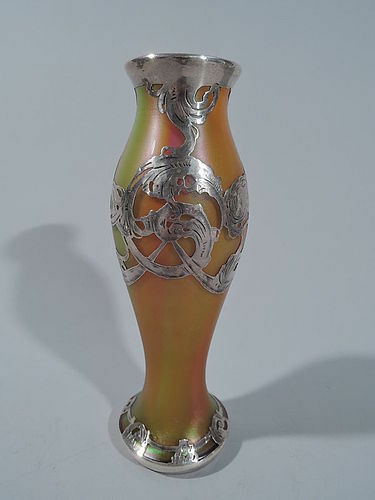 Baluster body in slightly iridescent yellow, orange, and pink. Overlaid silver rinceaux garland. Interior cased in white. Hallmarked. Very good color and patina. 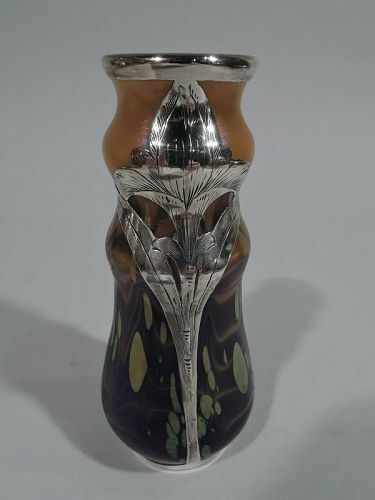 Art Nouveau iridescent glass vase with silver overlay. Made by Alvin in Providence, ca 1900. Bellied bowl with conical neck and wide mouth. Glass is gold. Floral silver overlay: a ring of big blooms joined by crisscrossing leaves. Hallmark includes no. 74. 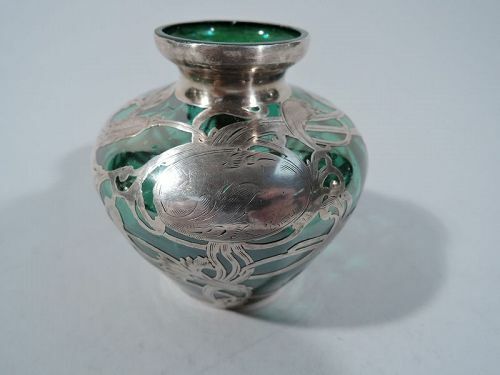 Very good condition with subtle shimmering and rich patina. 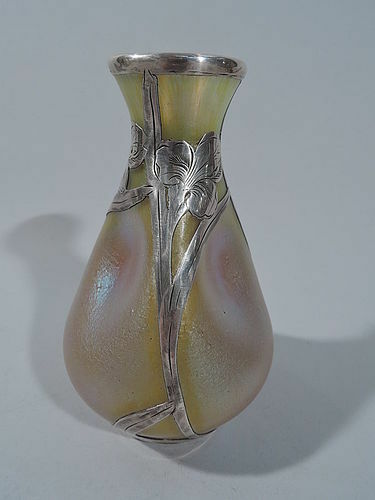 American Art Nouveau iridescent glass vase with silver overlay, ca 1900. Ovoid with ruffled rim. Glass is greenish-purple. Applied to front is symmetrical abstract ornament. A fine turn-of-the-century design. Unmarked. Nice shimmering and patina. 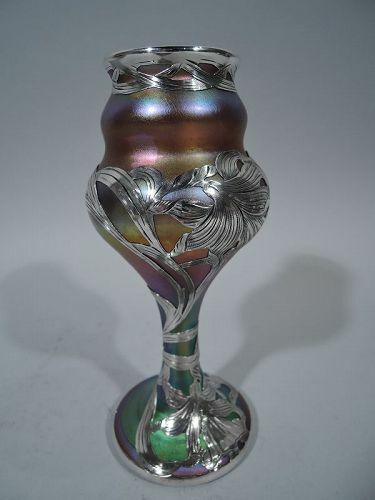 Iridescent gold vase with silver overlay. Made by Alvin in Providence, ca 1900. Pinched and ovoid with overlay frames in form of flowers and leaves. A restrained period design that shows off the rich and shimmering glass. Hallmark includes no. 92. Very good condition. 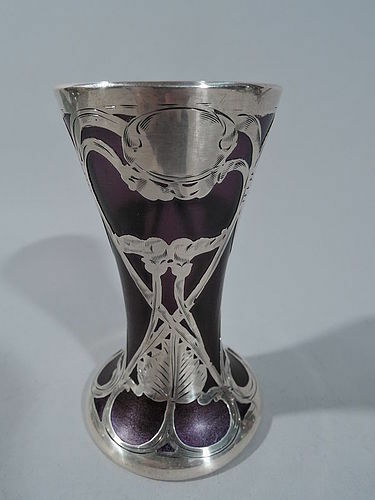 Art Nouveau purple glass vase with silver overlay. Made by La Pierre (later part of International) in Newark, ca 1900. Tapering sides and spread base. Repeating pattern with interlaced scrolls and leaves. Oval frame vacant. Faint hallmark. Bears apocryphal initials “LCT”. Very good condition with rich color and nice patina.